I’m obsessed with fishing for Chinook salmon. Fly fishing, that is. Determined. Anyone who knows much about me knows that chasing Chinook with a fly rod is pretty much what I think about 24/7. OK maybe that’s a little much. Maybe it’s only 10/5. By any account, Kings are there, swimming around in my head, much of the time. I‘ve heard stories about the Kanektok for years, but focused on our kings here at home. Oregon is my home water. Elk. Rogue. Sixes. Nestucca. Tillamook. The rivers, the salmon, the people, and the hope each day on the water brings. This year, I’m going to fish Kings on the Kanektok. Here’s why. 1. The opportunity to hook Kings on the swing. Here at home, I fish Clousers and Comets on the strip in tidewater. This is wonderful exciting fishing, but I long to feel a heavy tug on a fly that is swimming in a river’s flow. I’m looking for Kings fresh from the sea. The K-Tok is, I’m told, the premier place to swing flies for Kings. 2. I want to see the river and the curves and flows that are like god made them, without tide gates and levees and the sound of pickup trucks driving by on the highway. 3. I want to share the camaraderie that is so obvious in all the photos I have gazed at. I’m off the fence. 2011. I’m fishing the Kanektok, June 12-17, with my friend Jeff Hickman. We are going to the Alaska West tent camp operated by Deneki Outdoors. This will be “Week 1” at Alaska West. Week 1 is for the hard-core, they tell me. Week 1 will challenge me, I’m told. And Week 1 offers the hottest, baddest Kings of the season, they add, as if testing my resolve. By the way, I’ve got a feeling, a hunch, that Week 1 is going to be off the charts this year. I‘ve seen salmon and steelhead runs showing up early up and down the coast. Climate change, or whatever, I think that Week 1 will be hotter than usual. 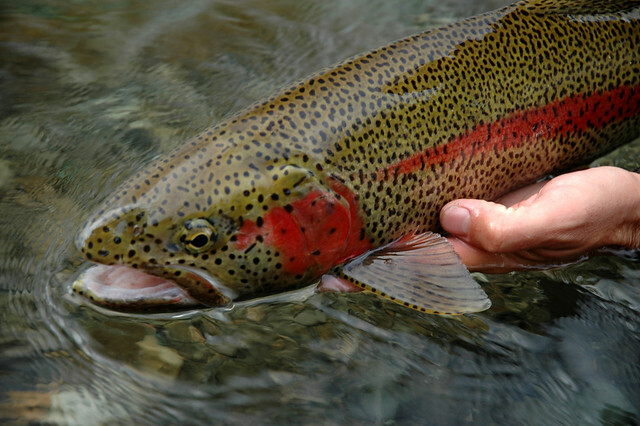 Plus the rainbow trout there love to eat mouse flies, and in Week 1 they are hungry and rested since last summer. I’m tying flies. I’m collecting my tackle. Putting loops on sink tips. I’m up to the challenge. I browse the meanest Tubes and Intruders in the Idylwilde collection: assemble my materials, and dream about Kanektok Kings as I tie. I know that I don’t need to take my own tackle and flies and waders and snacks. Hah. I’ll fish my own gear until the moment all my rods have shattered and Hickman shows me that his flies are pickin’ my pocket. My gear pile is already forming in the corner of the den. A new rod and reel are on order. This trip is a natural justification for a new camera. So, anyone want to join me and Jeff? Jeff and I will fly to Anchorage on June 11th, and make our connection straight to the Alaska West Tent Camp on the Kanektok the next day. It’s gonna be a most excellent fly fishing adventure. This would be a great opportunity for us all to plan our flights together and get some extra adventure time on the trip. Shoot me an email (jaynicholas@comcast.net). Call Chris at the Caddis Fly. There’s no better time than right now, cuz that’s about all we can count on. 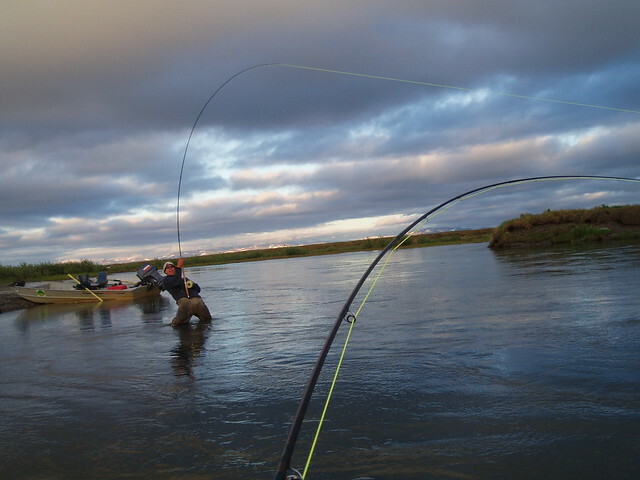 My two sons and I fished with Alaska West in 2008 and had a fantastic time. It was the trip of a lifetime. We managed to hit the silver run right on the nose the first week of August and caught so many fish just in the first day we found ourselves wanting to do something different the next day. So we fished silvers on surface poppers. Hysterical!! There were still some Chinooks in the river when we were there and they were huge. The camp is comfortable, the food is great and the guides world class. It’s an unbelievable river with enormous runs of fish. Try fishing rainbows on deer hair mice. A complete blast. You will have a fantastic time. Wow, looks like a dream trip. Why won’t springers bite swung flies better down here in OR? Hey, Jay………the problem is going to be at the end of the week when the time is up and they have to get you back in the plane to go home again. Sounds like the trip of a lifetime for sure for you……..wish I had a little more positive cashflow going right now for sure. There most likely is a weight limit on the last leg of the flight and you are going to most likely max that out on just flies you’ve tied so far………relax and have a great time. The folks that get to go on this leg are going to have a great time. It’s about time, Jay! How many spots are open for week one? 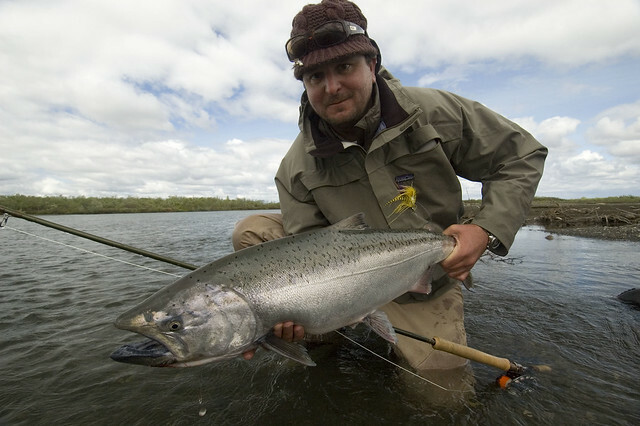 You will love fly fishing in Alaska. I fish on the Alagnak, the fishing action is hot and non stop. The Kings are awesome beyond words. Have a blast – I’m sure you will. You guys are gonna be rockin some bad a$$ grins. I have been on the Algnak but never the K-T. Too old now, but I wish you the best time ever ! I think that is not a question. I’ll be there week 4. I’m gonna miss fishing with you guys. I am so pumped! 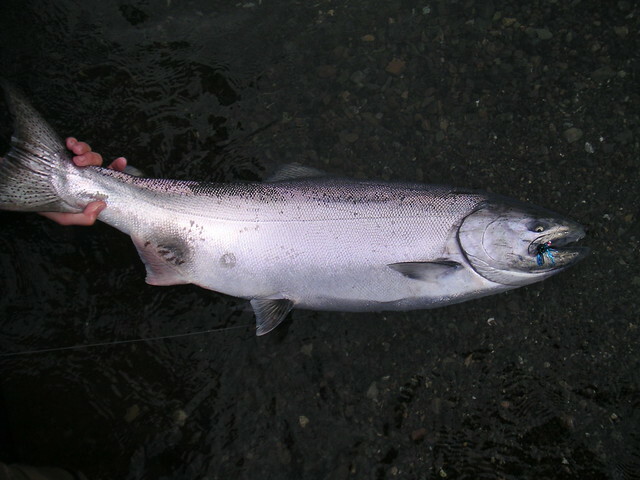 I fished the K-tok in 2009. It is absolutely amazing! If you can make it Gooooooooooo!! Sounds like a great trip Jay. I enjoyed hearing some first hand stories from participants at a recent spey casting class sponsored by the Caddis Fly(great class by the way!) regarding the Kanektok. Enjoy and post often ! I’ve always dreamed of swing-king chrome on the K-tok! It’s gonna drive me nuts to see the pix you guys bring back. If you can go but decide not to, you are fully blowing it. This is the real deal.